The mutation profile in the BxPC-3 CDX model mimics the inactivation of common tumor suppressors seen in pancreatic cancer. This cell line derived xenograft enables the researcher to transition their in vitro tumor cell inhibition efforts into an intermediate, preclinical system. These efforts include tumor proliferation inhibition from well-known drugs (e.g. erlotinib, silibinin), along with novel therapeutics such as pioglitazone and conjugated biomedical nanoparticles. These models also permit the coupling of tumor efficacy and circulating biomarker discovery. Proliferating tumor cells invade local tissue, travel through the circulatory system and implant in a foreign tissue. Metastasis leads to high death rates in cancer patients. Cell line derived xenograft (CDX) mouse models are highly utilized in preclinical assessment of novel cancer therapeutics and are a crucial link between initial high-throughput in vitro screening data and anti-tumor efficacy. Metastatic mouse models are utilized to understand the interactions of the anti-metastatic therapeutic and tumor in regards to all organs, bioavailability (e.g. half-life), clearance, immune response and tumor efficacy. Due to the inability to palpate metastatic tumors, the insertion of a luciferase (bioluminescence) or GFP (fluorescence) gene into the genome of the cell line of interest enables the researcher to visually track and quantitate internal tumor progression throughout the in-life portion of the animal study. U-87 MG cells expressing luciferase were implanted and the tumors were allowed to grow. Using a Night Owl (Berthold Technologies), tumor growth was monitored throughout the study after an intraperitoneal (IP) injection of luciferin. An image of tumor location and the ability to capture a quantifiable value for orthotopic or metastatic tumor progression is the main strength of the luciferase expression (emitted photons) in the U87 MG-Luc model. Figure: Expression of luciferase in U87-Luc MG orthotopic model. 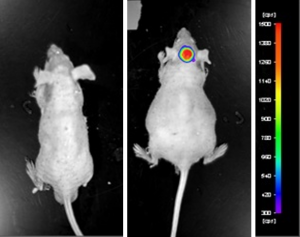 Control (left) and implanted glioma mouse model fluorescence (right) was captured after intraperitoneal luciferin injection (10 min incubation). View details of the case study here.